Language is our key to imagining the world, others, and ourselves. Yet sometimes our ways of talking dehumanize others and trivialize human experience. In war other people are imagined as enemies to be killed. The language of race objectifies those it touches, and propaganda disables democracy. Advertising reduces us to consumers, and cliches destroy the life of the imagination. How are we to assert our humanity and that of others against the forces in the culture and in our own minds that would deny it? What kind of speech should the First Amendment protect? How should judges and justices themselves speak? These questions animate James Boyd White's Living Speech, a profound examination of the ethics of human expression--in the law and in the rest of life. 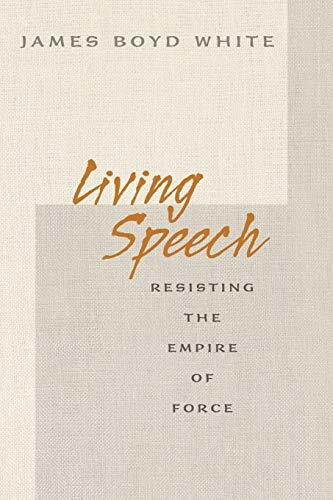 Drawing on examples from an unusual range of sources--judicial opinions, children's essays, literature, politics, and the speech-out-of-silence of Quaker worship--White offers a fascinating analysis of the force of our languages. 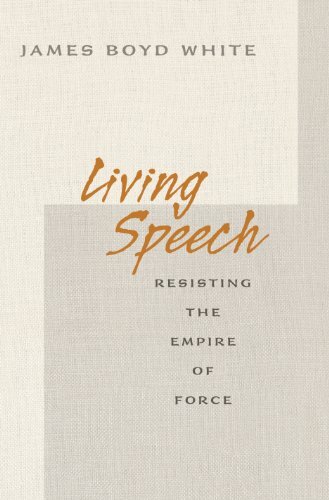 Reminding us that every moment of speech is an occasion for gaining control of what we say and who we are, he shows us that we must practice the art of resisting the forces of inhumanity built into our habits of speech and thought if we are to become more capable of love and justice--in both law and life.